One of the best on the market! Orijen makes excellent cat food. 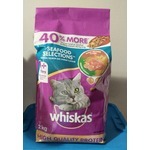 You can feed this to your cat and feel good about the ingredients and where they are sourced. I would recommend it to anyone. My cat will never go back! A year ago, we took-in a tiny kitten that had traveled over 4 hours under the hood of a truck (the driver didn't know until he stopped at a rest stop and heard mewing under his hood!) "Georgie" has thrived with our family! Given her rough start, I wanted to make sure she lived the rest of her life in luxury - cue Orijen Cat & Kitten. It has an exceptionally high price point, but the nutrition alone makes it worth it! Georgie is always full, her poop doesn't stink, she's very regular, no hairballs, and she is the perfect size! Her coat is beautiful, she rarely sheds, and the food itself doesn't smell. This food keeps her full for a long time, too! She grazes through the day, but never overindulges, which to me, means she's satisfied. 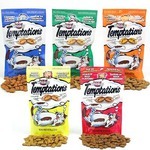 I can only get this food at a specialty food store, so if we run out and can't drive the hour away to buy it, I've given her corner-store cheap-o brand as a last resort -- she completely turns her nose up, and won't eat until I get her more Orijen. We have a spoiled kitty who knows what she likes in life, and Orijen Cat & Kitten is it! 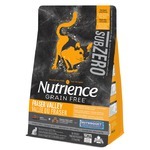 This is a high quality grain-free cat food. Although it is pricey, it is well worth the cost. It is ethically sourced meat and ingredients. 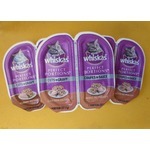 In addition to me being a fan of the food, its the only food my cats would eat as well!